By now, I don’t think I need to introduce my fabulous Pem to you… (you know, Pem who took me to San Miguel, and also inspired Carrot Koshambri, Red Curry Quinoa, Kale & Lentil Dal) but she’s inspired another recipe. This is one of her mum’s (Pria’s) standbys, and I need to learn her secrets, because it’s never as good as when I have it at their house. But this is one good curry for a weeknight, and is a perfect choice for the 5 Days Low Glycemic Challenge I’m doing this week! You can substitute dried beans, soaked overnight, but this is way faster on a Tuesday. Heat the oil in a heavy-bottomed pot. Fry the spices with onion, ginger, garlic, and curry powder. Add 1/2 cup water and cook until softened. Once the onions are soft and the mixture is glistening, add the tomatoes. Season with sugar and lemon juice. 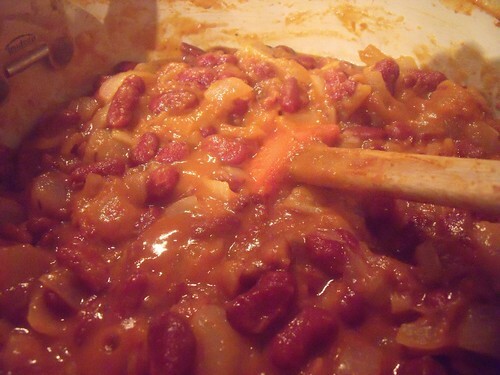 Add kidney beans and simmer for 30 minutes on low heat, stirring every 10 minutes. 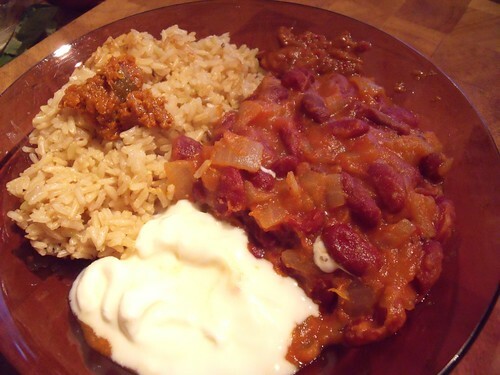 Serve warm, with brown rice or chapatis, and plain yogurt. I always like to add a little lime pickle and hot chili sauce on the side. I bet it would be awesome with some Best Kale Ever, if you want to get your greens in — I think that may be lunch tomorrow! Wow! I’m famous again on your blog! I do, however, think it’s my mom that deserves all of the credit for both San Miguel and this shortcut rajma! after the oil is warm: Start with cardamon (and I would then increase the pod number to 4 or 5), about 3 black peppercorns, the cinnamon (and remember to break the cinnamon stick in half – and Indian cinnamon sticks work better), 2 dried red chillies (I guess this is optional), and one or two cloves. thing is happening and you can sort of see the oil coming out, add the tomatoes (and you can add a few more than 4…) the key here is letting it reduce quite a bit before adding the sugar / lemon / kidney beans. Hope that helps! Love the pictures! Oooh, thank you thank you!!! See, these are the details I needed!!! And now we have to make it together sometime!!! I just re-read my initial comment. I love how I am as unspecific as possible, with the “a little water” ” 1 or 2 of this” “I guess this is optional lingo”. I AM TURNING INTO PRIA. And you understand how I had to convert the original Pria recipe to a “real” recipe. Sheesh. It’s nice to have the proper conversion factors!! Nope, always kidney… the browner was a stranger curry powder, probably.